Dr. Wellington obtained her PhD at the University of British Columbia and performed postdoctoral fellowships at Harvard Medical School, the University of Calgary, and the University of British Columbia. She joined the Department of Pathology and Laboratory Medicine at the University of British Columbia in 2000 and was promoted to Professor in 2011. Dr. Wellington’s research program encompasses the genetic and environmental risk factors that affect dementia, including apolipoprotein E metabolism, history of traumatic brain injury (TBI), and cerebrovascular dysfunction. 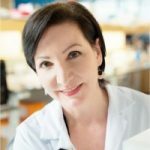 Her current research projects include drug discovery efforts to increase apolipoprotein function in the brain for application to both Alzheimer’s Disease and TBI, understanding the relationships between TBI and dementia, and innovative tissue engineering approaches to investigate cerebrovascular function in health and disease. Dr. Wellington’s niche expertise affords her a truly unique perspective. She is a highly sought-after speaker who has given well over 100 presentations in the last five years to both scientific and lay audiences and an active member of a wide range of multidisciplinary teams, committees, and grant review panels. She has served on the Editorial Board for the Journal of Lipid Research, and has demonstrated strong leadership in heading a team from the Canadian Consortium on Neurodegeneration of Aging. Dr. Wellington has published 95 peer-reviewed articles and 24 invited reviews. Her work has been cited over 6,000 times, as reflected by her h-factor of 43 (SCOPUS). In addition to her impressive body of research, Dr. Wellington is an enthusiastic mentor, and is actively engaged in service to the UBC community. She has supervised 38 research trainees, and founded a UBC Collaborative Grant Workshop Program that provides post-doctoral fellows with advanced skills in grant writing and reviewing. S Stukas, J Robert, M Lee, I Kulic, N DeValle, M Carr, J Fan, D Namjoshi, K Lemke, J Chan, R Wilson, A Wilkinson, R Chapanian, JN Kizhakkedathu, MN Oda, CL Wellington, “5. Intravenously injected human apolipoprotein A-I rapidly enters the central nervous system via the choroid plexus”, Journal of the American Heart Association, na, na. 2014/6 Published. Vitali C, Wellington C, Calabresi L., “4. HDL and cholesterol handling in the brain”, Cardiovasc Res, na, na PMID: 24907980. 2014/6 Published. Karasinska JM, de Haan W, Franciosi S, Ruddle P, Fan J, Kruit JK, Stukas S, Lütjohann D, Gutmann DH, Wellington CL, Hayden MR. ABCA1 influences neuroinflammation and neuronal death. Neurobiol Dis. 2013 Jun;54:445-55. Namjoshi DR, Martin G, Donkin J, Wilkinson A, Stukas S, Fan J, Carr M, Tabarestani S, Wuerth K, Hancock RE, Wellington CL. The liver X receptor agonist GW3965 improves recovery from mild repetitive traumatic brain injury in mice partly through apolipoprotein E. PLoS One. 2013;8(1):e53529. Hoekstra M, Korporaal SJ, van der Sluis RJ, Hirsch-Reinshagen V, Bochem AE, Wellington CL, Van Berkel TJ, Kuivenhoven JA, Van Eck M. LCAT deficiency in mice is associated with a diminished adrenal glucocorticoid function. J Lipid Res. 2013 Feb;54(2):358-64. Tansley G, Holmes DT, Lütjohann D, Head E, Wellington CL. Sterol lipid metabolism in down syndrome revisited: down syndrome is associated with a selective reduction in serum brassicasterol levels. Curr Gerontol Geriatr Res. 2012;2012:179318. Kruit JK, Wijesekara N, Westwell-Roper C, Vanmierlo T, de Haan W, Bhattacharjee A, Tang R, Wellington CL, LütJohann D, Johnson JD, Brunham LR, Verchere CB, Hayden MR. Loss of both ABCA1 and ABCG1 results in increased disturbances in islet sterol homeostasis, inflammation, and impaired β-cell function. Diabetes. 2012 Mar;61(3):659-64. Stukas S, May S, Wilkinson A, Chan J, Donkin J, Wellington CL. The LXR agonist GW3965 increases apoA-I protein levels in the central nervous system independent of ABCA1. Biochim Biophys Acta. 2012 Mar;1821(3):536-46. Fan J, Stukas S, Wong C, Chan J, May S, DeValle N, Hirsch-Reinshagen V, Wilkinson A, Oda MN, Wellington CL. An ABCA1-independent pathway for recycling a poorly lipidated 8.1 nm apolipoprotein E particle from glia. J Lipid Res. 2011 Sep;52(9):1605-16. Vila-Rodriguez F, Honer WG, Innis SM, Wellington CL, Beasley CL. ApoE and cholesterol in schizophrenia and bipolar disorder: comparison of grey and white matter and relation with APOE genotype. J Psychiatry Neurosci. 2011 Jan;36(1):47-55. Donkin JJ, Stukas S, Hirsch-Reinshagen V, Namjoshi D, Wilkinson A, May S, Chan J, Fan J, Collins J, Wellington CL. ATP-binding cassette transporter A1 mediates the beneficial effects of the liver X receptor agonist GW3965 on object recognition memory and amyloid burden in amyloid precursor protein/presenilin 1 mice. J Biol Chem. 2010 Oct 29;285(44):34144-54. Takechi R, Galloway S, Pallebage-Gamarallage MM, Wellington CL, Johnsen RD, Dhaliwal SS, Mamo JC. Differential effects of dietary fatty acids on the cerebral distribution of plasma-derived apo B lipoproteins with amyloid-beta. Br J Nutr. 2010 Mar;103(5):652-62. Epub 2009 Oct 28. Karasinska JM, Rinninger F, Lütjohann D, Ruddle P, Franciosi S, Kruit JK, Singaraja RR, Hirsch-Reinshagen V, Fan J, Brunham LR, Bissada N, Ramakrishnan R, Wellington CL, Parks JS, Hayden MR. Specific loss of brain ABCA1 increases brain cholesterol uptake and influences neuronal structure and function. J Neurosci. 2009 Mar 18;29(11):3579-89. Parkinson PF, Kannangara TS, Eadie BD, Burgess BL, Wellington CL, Christie BR. Cognition, learning behaviour and hippocampal synaptic plasticity are not disrupted in mice over-expressing the cholesterol transporter ABCG1. Lipids Health Dis. 2009 Feb 24;8:5. Hirsch-Reinshagen V, Burgess BL, Wellington CL. Why lipids are important for Alzheimer disease? Mol Cell Biochem. 2009 Jun;326(1-2):121-9. Hirsch-Reinshagen V, Donkin J, Stukas S, Chan J, Wilkinson A, Fan J, Parks JS, Kuivenhoven JA, Lütjohann D, Pritchard H, Wellington CL. LCAT synthesized by primary astrocytes esterifies cholesterol on glia-derived lipoproteins. J Lipid Res. 2009 May;50(5):885-93.